Well, I’m definitely not going to make it all the way through my “to do” list for 2017, but you know what? I’m okay with it. I’m actually quite proud of myself for the progress that I did make on the house this year. I’m definitely in that December state of mind, where I’m winding down the house-related projects. That doesn’t mean that they’re coming to a grinding halt, but more like a very slow crawl. A trickle. 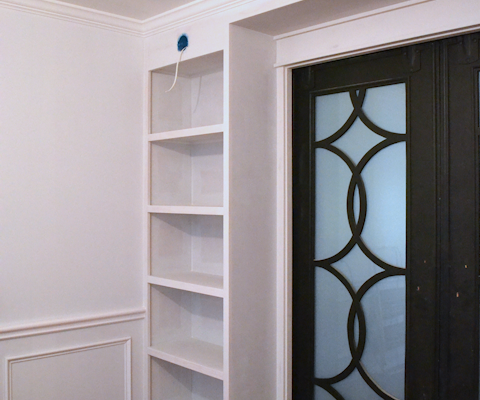 …and white on the trim. I’m not sure which white I’ll use. The one shown above is just the pure white base that they mix paint into, but I might choose something else. I want it white and bright, but not too stark. So that’s the one last big thing still to be done this year, and that will open up the possibility of so many fun outdoor projects in the spring — shutters, flower boxes, a pergola that I want to build above the breakfast room windows, etc. But in addition to that, I have about four or five things left on my “really, really want to get done” list in these next two weeks. First, I really want to get my hallway done. It’s so close! Sooooo close! I need to do some caulking on the cabinets, but the rest is fun stuff, like getting this wall finished. I decided to paint the table, and right now I’m trying out Kendall Charcoal, which is basically what I have on the fireplace in the living room (although the fireplace color is just a bit darker than Kendall Charcoal because I had them alter the formula leaving out the white). I have a coat of Kendall Charcoal on the table right now, but I’m thinking it might be too dark for the hallway, so it’s possible I’ll have to pick another color. I’ll be honest, I know green might be too much for some people, but I did this (really terrible) mock up and I just can’t get it out of my mind. I really love it (minus the distressed look). I also want to get that picture framed. I got my non-glare glass cut for it, so all I need is a frame, but I’m just having a hard time making a decision. I think I want a really thin gold metal frame to add just a whisper of gold around the edges, but every time I go to push that “place order” button online, I can’t make myself do it. But I’ll make a decision in the next couple of days and get this wall done. And then for the opposite wall, I ordered a set of prints from an Etsy store called Watercolor Paperie. 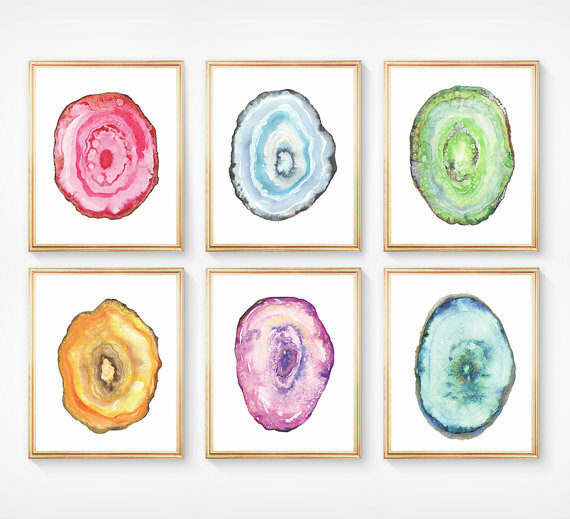 I’ve had my eye on this set of colorful watercolor geode slices, so I thought my hallway would be a great place for them. I have no idea when they’ll arrive, but I’m hoping it’ll be in time for me to get them framed and hung on the wall by the end of the year. I’d also like to get my piano completely finished. 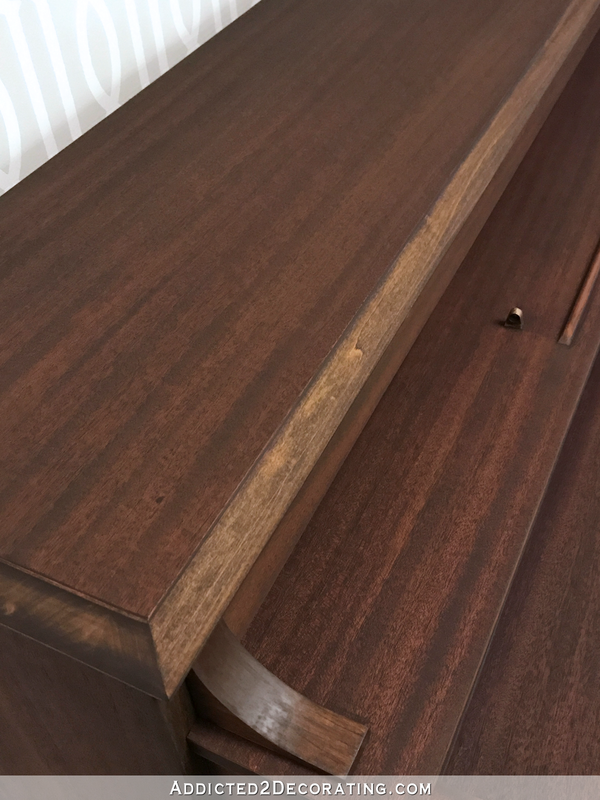 I needed a break from working on the hallway cabinets a while back, and decided to take a day or two to refinish the piano. Two days turned into a week, and by the end of that week, I had gotten all of the hard parts finished — stripping and restaining. I had even gotten some polyurethane on parts of it, but after spending a week on the piano, I decided that’s all the time I could spare away from the hallway cabinets at the time. So the piano project has been stalled since then. About half of it still needs a first coat of polyurethane, and then whole things needs a very light sanding and a second coat of poly. And when that’s done, it’s possible that it’ll even need a third coat. Now that the hallway is winding down, the piano is a pretty easy project that I can get back to and finish fairly quickly. I’ve decided to move the loveseat in front of the windows, and then use the other chairs (the ones I had originally planned to use) where the loveseat is sitting in the picture above. The others chairs are fully upholstered, with skirts to the floor, and they just look better in that position than the chairs with the wood legs. I think that that would be a beautiful color on my chairs. Safe. Predictable. A little matchy. But pretty. I mean, I can’t express how much I love those. And a bright warm color on those chairs just might be what my living room and entryway need. 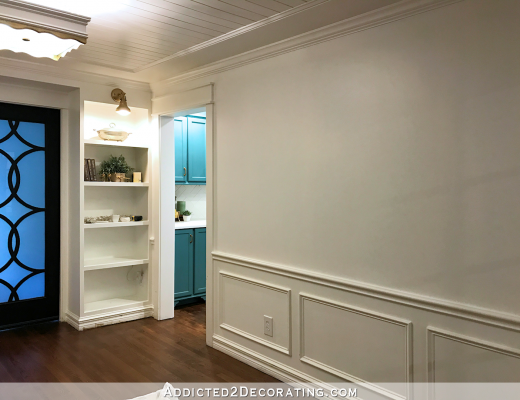 If I could find a velvet that’s similar in color to the trim that I bought for the draperies, I think it would be amazing. So as I wind down for the year towards my annual one-week complete blog/project break during the last week of the year, I do still have my eye on a few goals. And if any of you have any input on great sources for upholstery velvet (no cotton velvet — I like polyester velvet or poly blend velvets since silk velvet is generally way out of my price range), or if you have any input on the perfect Sherwin Williams white that will be perfect on my trim with the Mindful Gray siding and stone, I’d love to hear about it! I love all of your choices! I love the idea of purple as well as the orange for your chairs. The orange will have more visual impact, but the purple is so rich and beautiful too. Could you make slipcovers in either color so you could change them out? 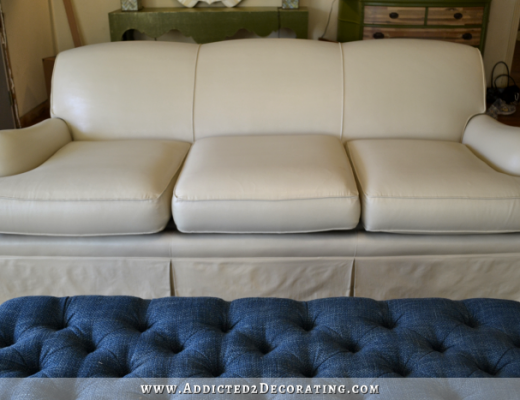 I have a couch and pillows that I change slipcovers on seasonally, or when they get spilled on, or just when I want a change! I’ve enjoyed your blog tremendously. You have so much talent and style! Keep up the good work! Have you considered dove white by Sherwin Williams for the exterior trim? Oooh, I was going to say that too! I love that one. I really like the green table!! Not Sherwin Williams, but Benjamin Moore White Dove OC-17 would be an excellent white for your trim. A very slightly grayed white that reads true white without being blindingly so. 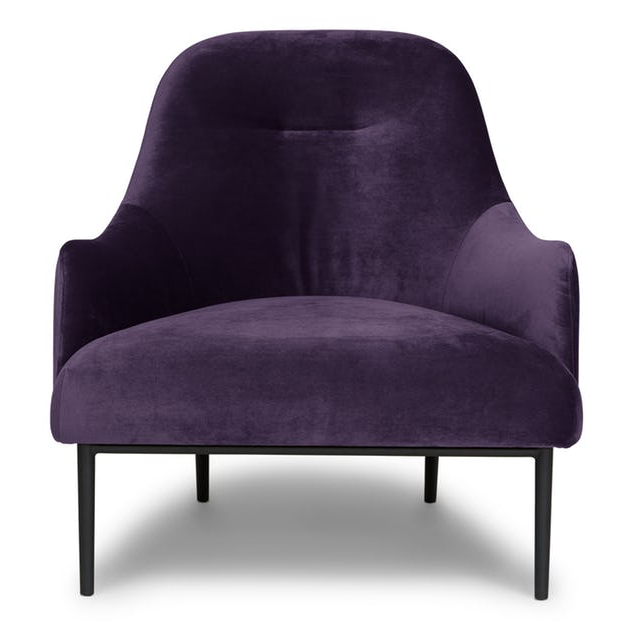 I love purple but I think the purple velvet on those chairs looks dark rather than bright and would bring down the light, colorfu, and airy vibe you have going on. I love the tangerine velvet, though! If the chair backs will be towards the entryway, perhaps this is the place to put a fabulous print on the back of the chairs. I loved that peacock fabric from the Pier One chair suggested a while back but I am sure there are other embroidered, woven, or even printed fabrics that would be great. Silk or silk-look would be awesome with velvet if you can keep it safe from Peeve’s claws. What Adele said, and best wishes for an enjoyable rest of the year to you and Matt. I second the BM White Dove. I have that in my house and love it! I opened this post right away because I loved the purple chair. What a stunner. Don’t think it’s predictable at all. Why not bring in those coral chairs that you covered to see if you like having the orange tone in there. I don’t think the purple is playing it safe at all. I think it’s a bold and beautiful choice. I also like the orange so I’m of no help at all (not that you need it). I just thought that if you are wavering, the other chairs might give you a feel if you like having a similar color in there. I also like the green on the hallway table. Ditto what Lona said: I’ve enjoyed your blog so much this year and am looking forward to learning from all your future projects. My kitchen/family room area now has a matching set of Roman shades that I made using your tutorial. They turned out great. So much more professional looking than they would have been if I hadn’t found your thorough instructions. Thanks again! I love “white flour” for trim. I’ve been using Polar Bear White on all of the trim on my house (interior and exterior) since you recommended it years ago. I have it paired with Gentlemen’s Gray on the exterior and love it. When I look at the photo of your LR taken from the doorway, the first thing that catches my eye is the red bird picture. It might be coral, but on the computer it looks red. And isn’t there a red/rust/coral part of your rug? Perhaps match this, especially since you like that orange/coral color anyway. That would really tie in rug and pictures. Just not sure what they would look like when in the LR and facing your entryway. I’ve already forgotten what it looks like (except your artwork). Since it’s all one big room, it should all tie together. I veto the purple – too dull and dark. I’m amazed you are even going to try to do anything else with Christmas coming on. End of year, time to rest! I agree! I also think it might look good with the pop of pink that is inside the tryptich artwork that is in the entry way. I think a bright white trim will look very crisp with the grey paint. Your home will look amazing once it’s all painted. An orange, yellow or red front door would be a bright accent and look great from the street. You have accomplished a lot in the last year. You amaze me with what you achieve each year. Your goals are very ambitious each January but life can get in the way sometimes and there are always unforseen things that can slow a process down. I feel like a sloth comparing what you get done each year with what I accomplish. What color are you going to paint the front door?? Something bright and warm in the red/orange/coral range. Check out BM Claret Rose…it’s a beautiful, bright color. I highly recommend Joybird.com for upholstery quality velvet. They are a mid century modern furniture company in CA that also sells their fabrics by the yard. I just had an overstuffed chair and ottoman reupholstered in their Royale Peacock velvet and it’s gorgeous. It is a polyester velvet and the color and quality are outstanding. Couldn’t be happier with the final result. My only caution would be to order their free samples online. They arrive in just a few days. There’s something so nice about being able to touch the fabric and see the actual color. I have a chair I upholstered in Hudson 43 upholstery velvet (a division of Richloom) bought at Joann and it’s holding up well. I’ve actually put the cushion covers in my front load washer on delicate and they came out fine. I did wash a sample before buying and pre-washed the fabric before making the covers. Unfortunately the color range is limited. Have you tried fabric.com? They have a wide color range of synthetic velvet. Love the green on the hallway table. It really makes the green in the art pop. Whatever you do or don’t get done the rest of the year, make sure you give yourself a HUGE Christmas present for ALL you accomplished. You are a force Mother Nature could envy!! Have a great holiday. ❤️ all of your choices for your home. Years ago a painter told me whenever he paints trim white he has the SW store add 1 drop of black before they put it on the mixer. He said it makes the white brighter. I asked the folks at SW and they never heard of this. This guy was such a pro. Even his dry wall repair was perfect. Unfortunately the next time I called him he was retired. Looking at the picture of your house above, I just went through your rooms in my mind (like: ok, there is the fireplace, and there is the kitchen and over the the door between breakfast room and studio …) , picturing how they look today – two thoughts about that: 1) It’s weird that I know my way round your house much better than some of my friends’ places 🙂 and 2) I realised just now how much the house has come along in 2017! I’m glad you do not beat yourself up about the things from your list that didn’t get done this year, because life got in the way again and again like with your back (and it was very sensible to take a break to get thoroughly better!) and even more this year everything you did seems to be so YOU! So that there isn’t the feeling that you might want to change big things around in the near future but can move on to the next rooms in 2018. I never minded your urge to change things which had already been done, because to me your blog is a journey where I learn stuff, but it is nice to read that you are so happy with what you’ve accomplished in the last 12 oder more months, so I rejoice with you over that, too. I love the purple and the orange/coral chairs! Either would be beautiful! https://www.houzz.com/photo/2042686-hospital-home-lottery-fall-2012-contemporary-living-room love the way they put the fabric from the one chairs on the pillows for the other chairs. http://Www.greenhousefabrics.com has an extensive velvet selection. I have an account with them, so holler if you need help getting in for pricing and ordering. For velvets, try Home Fabrics and Trim (also goes by Rodeo Fabrics). Based in Los Angeles. They have tons of velvets and drapery fabrics. I haven’t personally used them but on the internet is SyFabrics. They have velvet upholstery at really great prices. You’ll have to see if you like any of the fabrics. They also allow you to purchase a swatch first. I think you have gotten a lot done this year! Keep it up in 2018! 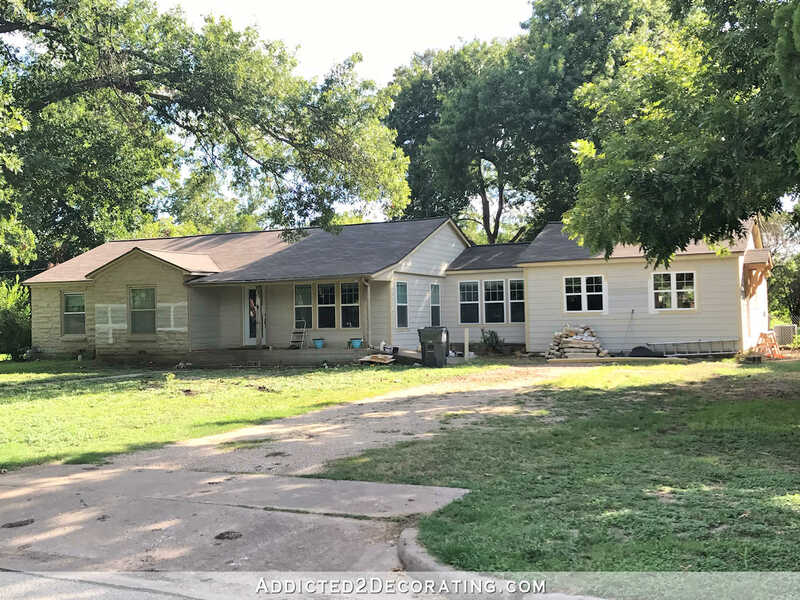 Firstly, congratulations on getting your home exterior painted next week…….love the Mindful Gray color! Your blog heading was winding down, but wow, all these projects sounds like ramping up! Can’t wait to see all the final reveals and what a way to end 2017 with so much accomplished this year. IMHO I think the hallway table will look better in Kendall Charcoal as it will be the neutral to both your wedding watercolor and the new watercolor geode slices, which are gorgeous! I also agree with one of the other comments, that you should put the 2 coral chairs you upholstered temporarily in your living room, just to see if you like the coral color in there now, before you order fabric. Whilst I love the purple color on the chair you showed, I’m wondering if it’s not enough contrast with your new curtain fabric and a coral type color will tie in the bird print, and the drapery trim. This is all making a very exciting way to end the year. Well done Kristi. I agree completely with Sharon…the gray table in the hall will allow the artwork to be the focus. With so much going on (stripes, green table, blue doors) the eye needs a clear focal point to rest on. I like kendall charcoal too. From the mock up it looks like the grain on the little table is going to show throhgh. Was that what you intended? I personally think it would look nice as a solid color but whatever you decide will look nice. Totally not intended. 🙂 My photo editing program has limitations. I need to get Photoshop, but it’s so expensive! I’m just curious, and I don’t recall if you explained before, but why do you dislike cotton velvets? Is it the sheen? Or the wear? Cotton velvets can actually be very durable. The reason I don’t like them is because of the sheen (cotton generally has no sheen) and the feel. Polyester velvets tend to have a silky feel to them, where cotton velvet generally doesn’t. I just really like that silky feel and the very subtle sheen they generally have. Not really. Mohair tends to be very expensive — generally around $80-$100/yard, if not more. If I found a bargain in the right color, I might consider it. Thank you! That helps me as the fabric I’m trying to match is more of a chenille feel… not very shiny at all. So actually I should probably be looking at cottons! LOL! Have you considered SW7008 Alabaster for your trim? Or SW7005 Pure White if Alabaster is too warm/yellow. A Coral Colored door would be great. Can’t wait to see what you choose. The flower boxes and plants outside will brighten things naturally. Your living room rug will be good inspiration for your gardening. I think orange/coral/tangerine (in that family, anyway) would be best for the chairs, because it would for into the curtain trim and make the color not seem like it came out of nowhere. It’s funny about those agate prints. I’ve had those pinned on Pinterest for some time, and they have the one that has an orange tone. Then if you could find an upholstery fabric that had all or most of your living room colors to go on the backs, that would be stunning and bring it all together. It wouldn’t even have to be velvet. Ha ha. Only you would say that purple would be safe! Love that. Personally I think purple would be awesome in the room, but in small doses. The coral seems like a better vibe with the blues going on. I also like the green table but would only change it to green once the pics are all in place. They need to shine. They’re all awesome. Looking forward to seeing your exterior walls once they are painted. Pat yourself on the back for a job well done! I prefer your hall table stained but am excited to see what you will do to change my mind, like you always do. Merry Christmas and Happy New Year to you and your family, Kristi! I love teal with orange. I still remember this combination when I toured a model home over 20 years ago. I guess it made a permanent WOW moment for me. Thank you for your blog this year and blessings to you and your family this holiday season. !. Not a fan of the green table in the hallway. Personally, I would look for a darker shade of the stripes, so it won’t compete too much with the other colors. Or make it the same as the cabinets. 2. I like the orange/coral chair vs. the purple for the brightness it brings to a quiet looking room so far. The purple is too moody and dark. 3. A pat on your back for getting SO MUCH done this year, and not having to redo much at all. I think it helped you to be slowed down with injuries, so you had time to ponder the courses you were on. Sometimes it helps to not rush too much, unless you have already spent a lot of time and thought on things. Have a very restful holiday, but instagram the outside paint job before you vacate to time off! I think your purple is anything but safe or predictable! Still, after reading all the comments, I’m leaning to the coral range for the chairs, especially now that you have that gorgeous trim for the curtains. It also sounds like you have enough chairs you could just swap them around when you want a change of color. Not finality, but flexibility, maybe. I definitely like the charcoal fireplace color for the hallway table. It would be a connection between the rooms, and would be just enough to ground the hallway, which I think it needs. To me, the green is just one touch too much. I am so in awe of all you accomplish, and how fast you do it. And it’s all beautiful. Can’t wait to see what you do next. Check out Sherwin Williams Snowbound for your trim. I just used it on my exterior trim and it looks fantastic. I know you’d hoped to be further along in your list but you have accomplished so much. One OCD request: please, please install your outlet/switch covers. It will take less than 10 minutes, and help those of us with an eye for small details immensely while we enjoy your blog. You’ll be very happy to know that I finally remembered to purchase outlet and switch covers a couple of days ago when I was at Home Depot. 😀 So I can finally get those covered. Oh, Kristi, you got so much done this year! 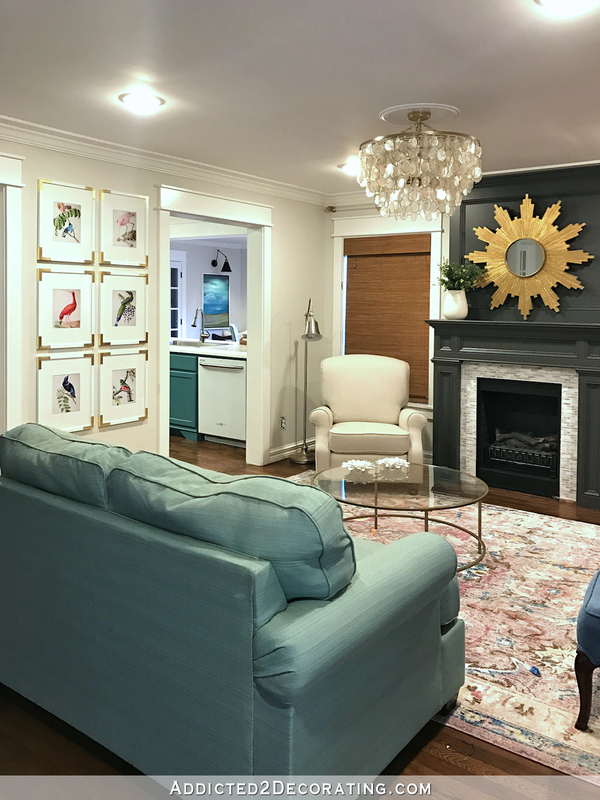 Your breakfast room, music room, living room and hallway walls are all done and you have colors picked out in each space. You even changed your kitchen colors. 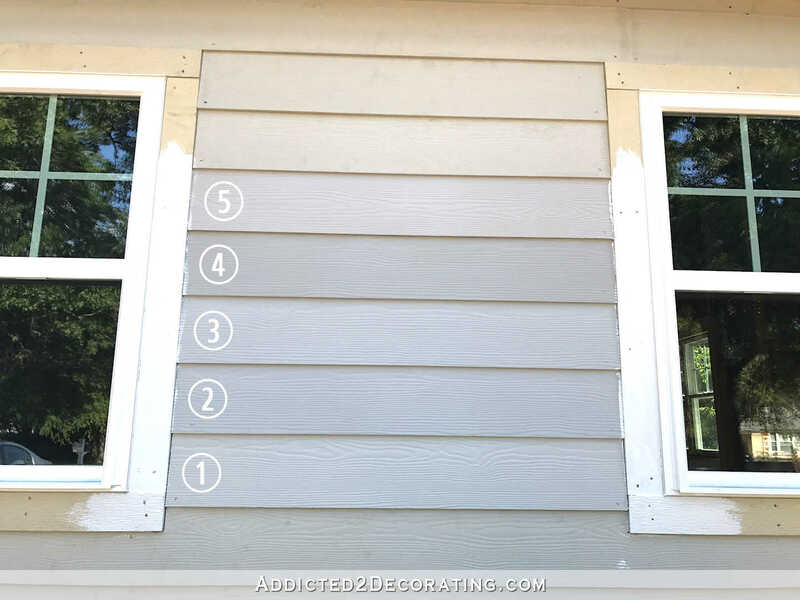 You have a direction in the house and are even getting the exterior painted. Not to mention your studio! Think about where you were at this time last year. You even took off time to heal and still got so much done! I agree that you should seriously consider the orange chairs and possibly a print on the back and the table in the hall a darker shade of the stripes. Oh, and by the way, I LOVE the stripes! And I love how you’ve embraced grey and made It work so well for you. I sure have enjoyed following along with you. This past year has been my favorite one yet on your journey. I can’t wait to see what next year brings! Have a very happy and restful Christmas! Dead of winter would be a good time to finish the living room drapes. The living room is really pretty but the windows look kind of naked. I would also stay away from the green table. The color takes away from where you want the focus, which is on the art work. I think the Kendall Charcoal would be fine but you might try staining it a very dark color. It would give the finish more depth. I am having trouble finding the Watercolor Paperie on Easy. Can you give me the exact link to get those Malachite prints? Thank you. I also love the Orange chairs very bright and a pop of color will look great with the “turquoisey” theme. I have no opinion about the chairs, but do feel to add a print to the back could detract from the fabulous rug, but maybe not, I’d have to sleep on it. The table, in my opinion, even if not distressed still says country in green. I’m thinking the purple of the cabinet in your breakfast room would be nice. Have a good holiday and remember to take some time to smell the cookies! 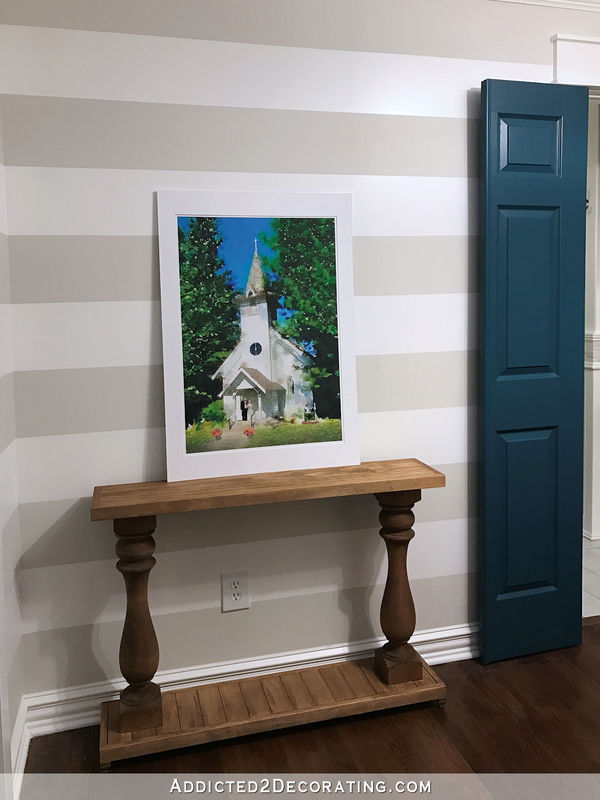 I used Mindful Gray on my tiny home/ Everyone that goes compliments this color, including the past owner. You have worked so hard. Merry Christmas to you and yours!